This course is finally the real deal! It starts with tracking & lens distortion basics – each tracking type is reviewed (2d, 2.5d planar, 3d), and several lens distortion analysis methods & importance is revealed. 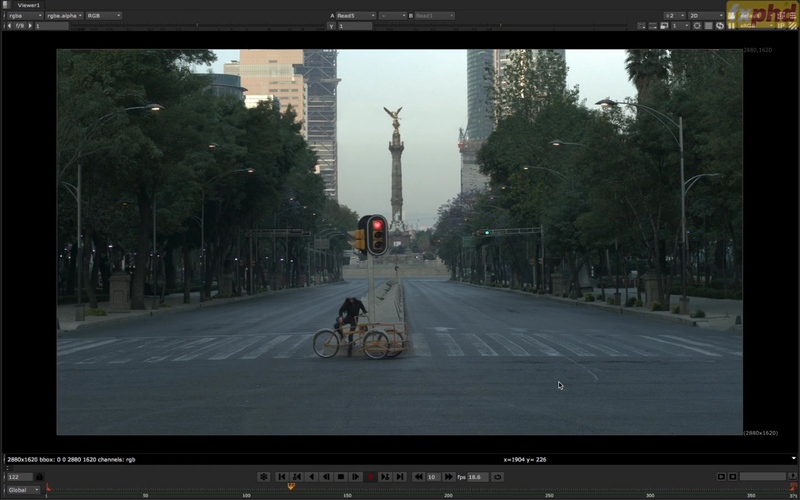 Chapter 2 throws us in the middle of production, by removing every visible person or car from Mexico city shot. Then you get a deep 3d tracking excursus with some python basics, error checking. in nukescript (in labels or knobs) you do [knob something], or [value something] if you need a final value calculated. Showing dense point cloud generation, and model reconstruction with several methods including Model Builder. After that goes the face-tracking (without inner-face motions/emotions), followed by live brushes & some “digital makeup” (or makeover, I should say). Next you dive into Python scripting, making snippets, generating nodes and links between them. The explanation is very simple to understand (although I knew python before :)). Vignetting removal was touched shortly. The you’ll see the usage of spherical mapping, generating environmental coverage from camera, optimization of spherical transformations by generating cubical 6-camera rigs + cubic-to-spherical transform. This part was long and boring, but maybe will be useful some day. And lastly the Nuke<>Mari linkage is shown on an example of erasing cars from the road fly-by. Generally, the course was useful. Many of good and deep production techniques and conventions are shown (e.g. making projection cameras blue). Now I’m watching NUK214 – and it’s much more interesting, and many cool points and workflow tricks can be taken on a pencil. It’s told by ZERO VFX production guys, and is more close to real-life practice. The first thing to note is workflow folder structure – they have well organized it by client, by project (year & proj#) and then images, io, references, and source work files. 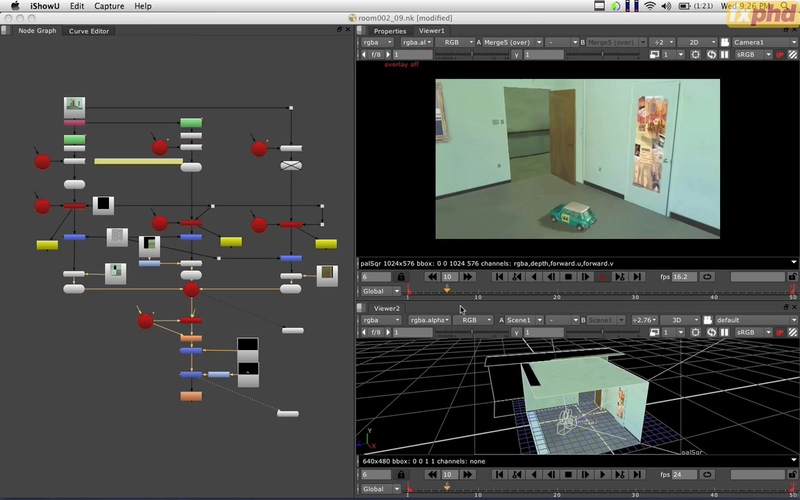 The cool thing I noted is a Precomp node shared path in it – they use it to parallel the studio work – so one person can do a quick mockup of a roto, save it as .nk on shared drive, and another one can start doing clean-ups, importing the roto NK with a Precomp, then reloading it along the way it’s done by another guy. The bluescreen part was awesome, showing additive keying principles with IBK, tweaking & stuff. Photography modeling looked great as a preview, but was pretty boring to watch, although some key image-modelling & projection techniques were shown. Then there was a channel overview (basics mostly – how to deal with layers & channels inside a node, how to merge them, etc). Followed by render-passes breakdown & compiling (on a somewhat too simple example). 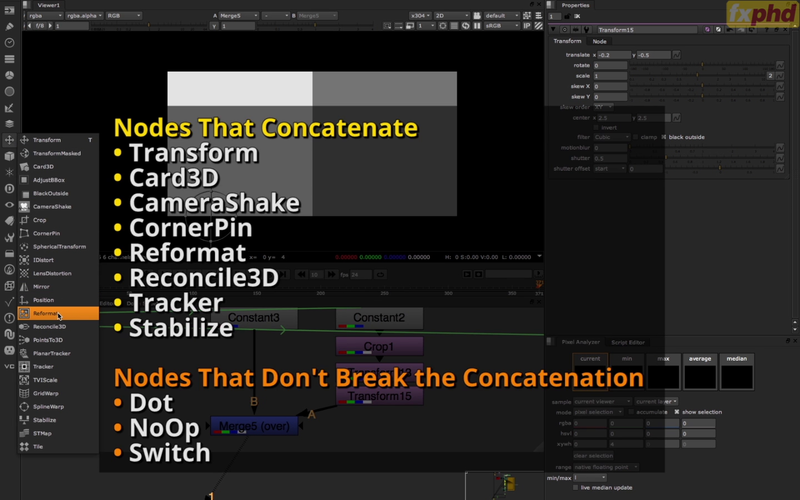 But that should finally cover the “show me how to compile render passes in Nuke!” questions once and for all – who wanted to learn this – must watch this. – and what was most interesting – using the STMap node with rendered UV channels for adding gunfires onto a rendered plane (without tracking it). You can also replace textures with that, or draw on them to add decals, etc. Well, anyways, the course was much more interesting to watch than previous NUK210, although some places were a good insomnia pill too (especially when watching in bed :-)). I guess I should write notes as long as I watch my FXPHD courses, and give reviews on them – that’ll help me to remember key points I liked most, and also for other people to get some opinion on different courses available. I have already completed “NUK210 – NUKE IN PRODUCTION – I”. It’s a pretty simple course, about camera projections, then simple roto & simple key, 3d cards placement, with some warp transformations & stuff, some basics about color spaces (linear, log, srgb), then 3d keying with 3d plates placement, and post DOF & MB passes. The samples don’t look too “production”, and are more simple, maybe because the course is old and simple too. It was boring for me to watch, and it was a good insomnia pill too, so I watched it 2X, (although I got a couple of points for myself, not so important to mention). Especially the laptop screen “reflection” gave me a good laugh. 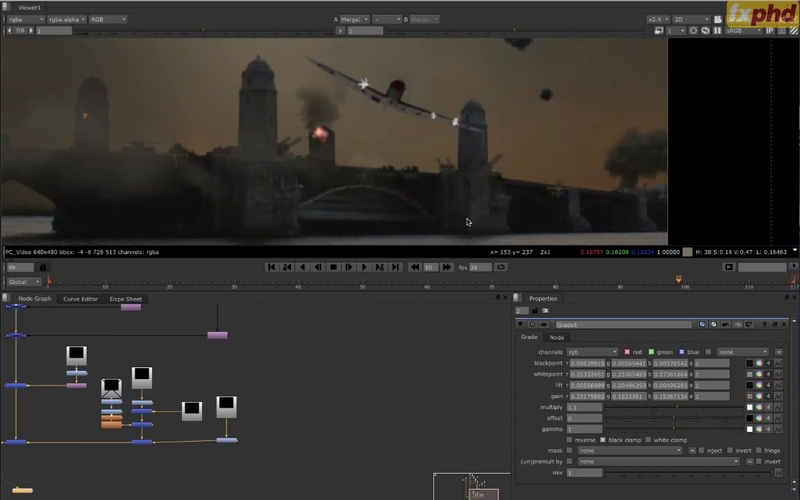 Well, still it can be recommended to pure VFX noobies, who want to see what’s Nuke is all about, and what can be done in it, in a funny way. Good tip: shortcut Shift+X to change A & B inputs of Merge and other nodes. That’s short, for the start. More similar posts coming. Finally made my 2014 showreel!